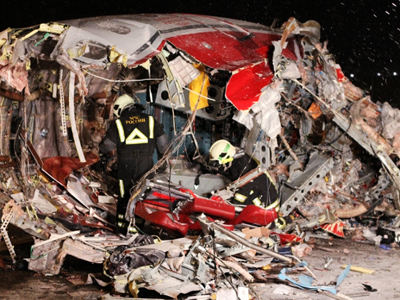 The fifth victim of Saturday plane crash near Moscow Vnukovo Airport has died, succumbing to her injuries. The horrible crash was captured by a dashboard camera in one of the cars on the highway. The footage of the actual plane crash recorded by a dash-cam in one of the cars driving by appeared online overnight. The 30-second video shows the plane crashing into a road safety barrier and its debris hitting the car carrying the camera is placed and another car passing by. The highway was not busy at the time of the crash so drivers managed to avoid a major accident. Yet the incident caused a massive traffic jam, hampering rescue teams and ambulances rushing to the scene, witnesses say. Drivers who happened to be near the scene of the crash were trying to rescue those on board injured. Eyewitness Nikita Kasperchik helped two men who had suffered many injuries, rescuing them from the debris. “We tore off part of the plane, put it on the ground and put the guys on it. There were blankets scattered everywhere, so we covered them with blankets,” he told Rossiya-24 TV-channel. Rescuers by chance also tried to organize victims` transportation to hospitals. “We were looking for a car where we could place him [a crash victim], unfortunately, a passenger car would not fit him, so we stopped a minibus taxi… put the victim in it and took him to hospital,” another witness said. The only people drivers could not help were the pilots, who were trapped in the cockpit. Witnesses tried to break the glass to reach to them, but it was too thick, so they had to wait for rescuers to arrive. For more details watch RT’s Madina Kochenova’s report from the scene. The Tu-204 aircraft belonging to Russian low-cost Red Wings airline performed a hard-landing at Vnukovo Airport, southwest of Moscow, on Saturday evening. The plane, flying from the Czech Republic, was practically empty, with only crew of eight on board. Four have died and the other four were critically injured in the crash. One flight attendant succumbed to her injuries on Sunday bringing death toll from the crash to five. As of Sunday the three survivors were in intensive care in Moscow hospitals. The four killed on Saturday in the crash were the first pilot, second pilot, flight engineer and a flight attendant. The official procedure of identification took place on Sunday. It was announced that the families of those died in the accident will be paid 1 million rubles in compensation (about US$33000) as ordered by Moscow Mayor Sergey Sobyanin. Several large parts of the plane remain on the side of the highway, as it is difficult to remove them due to their size and weight. Rescuers have covered the remains with cloth. 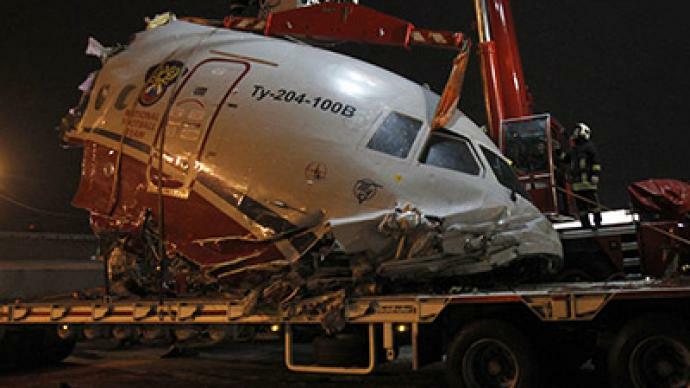 ­The likely cause of the crash is a pilot error, but the investigation is still in progress. Two flight data recorders recovered at the scene are being examined by Interstate Aviation Committee experts. Investigators have obtained flight documents, recordings of the pilots’ conversation with air traffic controllers and samples of the fuel. They also plan to question the four survivors of the crash as soon as their condition allows it. While the results are still to come, very little information has been disclosed by the authorities. However, media have been quick to speculate about possible causes of the tragic accident. The most widely-circulated versions are a personal conflict on board, bad weather conditions or technical problems. 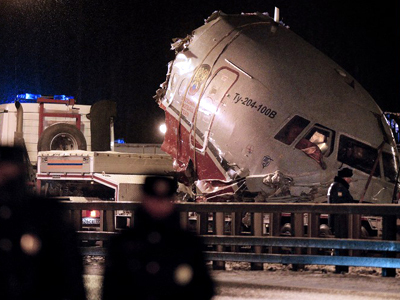 It is a very strange situation that in normal weather conditions the plane couldn’t put the brakes on properly and drove out the airport premises, first class pilot Aleksandr Akimentov told Komsomolskaya Pravda newspaper, explaining that there are three separate brake systems in the plane, which if used would stop the aircraft in the middle of the landing ground. “My theory is that there was a conflict on board. The plane was trying to land for the second time. And someone – commander or the second pilot – was saying ‘That`s it, we’re landing,’ while another one was trying to persuade him to do the third attempt… I suspect that the argument lasted till the very last moment and the other two brake systems just were not turned on,” he concluded. Others, however, suggest that the weather was far from perfect, with a strong wind while landing, low clouds and poor visibility possible reasons behind the crash. Another popular theory is brake failure. 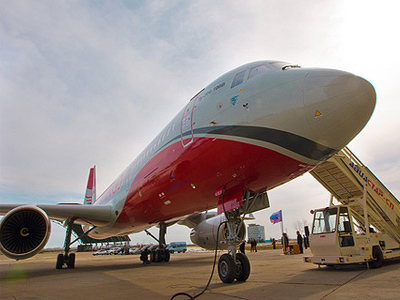 The reverse mechanism on the Tu-204 was in very bad condition, an anonymous source from the Investigative Committee told Russian web tabloid LifeNews. Such an accident happened a week earlier at an airport in Russia’s Novosibirsk, where a Tu-204 aircraft also overshot the runway because of the reverse gear failure, Komsomolskaya Pravda reported. Incidents involving reverse failure on Tu-204 planes have been previously reported by the Russian aviation agency, however none of the accidents were fatal.